In 1984, Tom Walter founded Tasty Catering, a catering and event planning company in Elk Grove Village, Illinois, with his brothers Kevin and Larry. For years, Tom says he and his partners had a command-and-control leadership style. About 12 years ago, all of that changed. One day, two of Tom’s employees—who were in their 20s at the time—gave him an ultimatum: “Change your ways or we’ll leave,” they told him. 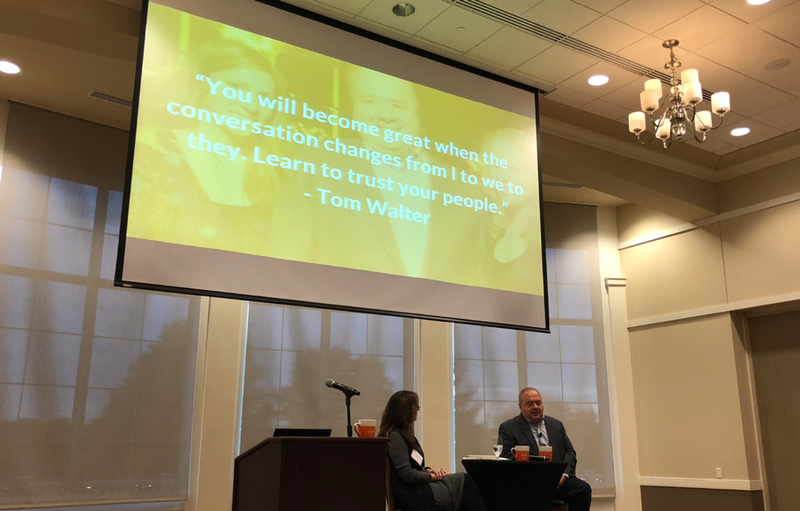 Tom shared this story when he visited Cincinnati for our Small Giants Executive Breakfast series, made possible thanks to the Entrepreneur’s Organization. Tom says even though the conversation was a complete surprise to him, what happened afterwards was a positive cultural and personal transformation. He learned that to work with the younger generation, he had to change his way of leading. That one, pivotal conversation would change the course of his company. It wasn’t easy, but it gave him the opportunity to shift his leadership style. Today, Tom serves as an example of an authentic leader who cares deeply about his people. Tom does whatever he can to help them become the best versions of themselves, in all areas of their lives. Just as Tom exemplifies authentic, empowering leadership, Tasty Catering is evidence of what can happen when such leaders equip their people and care about them as…well, people! Tasty Catering is on the Forbes America’s Best Small Companies List, a notable list of the top 25 small businesses in America with incredible company cultures and stories. They’ve also won more than 20 “best places to work” awards. The purpose-driven company also has a turnover of less than 2% in an industry that averages 50%. And its profit margins are as much as twice the industry average. Tom’s accomplishments are just as impressive. He’s a serial entrepreneur who has acquired wisdom from the start-up, acquisition, sale, and–in a few cases–termination of businesses in a variety of industries. He’s a go-to thought leader and author when it comes to fostering a contagious culture and for growing a business with a focus on purpose before profits. Besides being a popular speaker across the nation, he’s still involved at Tasty Catering. There were many takeaways and memorable stories from the Q&A discussion with Tom, but here were two additional highlights for me. Want a quick way to assess the state of your leadership today? One way to tell is how you talk about your people. When sharing stories about your business with peers, do you use the pronoun “I….”? Or do you talk about “We”? Or do you talk about “they”? One of my favorite things that Tom shared was how it’s simply not about you as a leader. Yes, you are always going to care about the business—and perhaps you might care more than anyone—but it’s not about you. No wonder Tasty Catering has 9 spin-off companies started by Tasty Catering team members! In that journey, Tom shared how he’s realized that the most important “process” in any business just happens to be the most complex: it comes down to human behavior. Focusing on people instead of products and processes is where he puts his focus. The result? Employees who are invested in their work, invested in adding to the company culture, and leaders who want to do what’s best for the business and the community. With that in mind, he also shared the idea and importance of “HERO”, which is a concept of psychological capital. Tom learned about positive psychological capital from Fred Luthans, Ph.D., who has conducted much research and authored many books on this topic. Hope: In this context, it means we have the ability to see the way to our goals. In other words, it’s the positive state where we believe we can achieve a certain outcome. Efficacy: we know it as confidence in yourself. It’s our capacity to know we can carry out a task or project to get to a certain outcome. Resilience: our ability to bounce back and to handle uncertainty. Optimism: our view and the energy we have about what can be achieved. This “HERO” leadership concept has been linked to job and life satisfaction. Not only that, but the more we’re able to develop this capacity, the healthier and more engaged our entire team will be. It’s a concept Tom has been focusing on as he looks to help others find success and thrive…and that’s even if they aren’t working at Tasty Catering. “All of these things we can work on, practice, and develop to become better leaders, and to become better at our work,” shared Tom. I’ll be waiting for more from Tom on that subject in months to come. You are invited to join us as we tap into the heart and soul of leadership with an in-depth, personal interview of Joe Motz, CEO of The Motz Group, on Friday, December 14, 2018 from 7:15 AM to 9:00 AM EST. Learn more and register today.